​Vladimir Megre: Good afternoon, friends. Right now we’re driving along the road in Bavaria, Germany. We decided to explore a little place with a campground where you can hold meetings. Remember I was saying it would be good to gather for a day or two, on the weekend, to communicate with each other. ​As you can see, the terrain is slightly mountainous and very beautiful. The road is great. It’s Dima Yaromov driving, and he drives well. And the car is good, Mercedes. Class … Dima, what class is it? ​Dmitry: E 220, I think … Wagon. ​Dmitry: Yes, if it wasn’t a wagon, we couldn’t carry all our stuff. ​Vladimir Megre: Yes. It seems our stuff has increased. Don’t you think? ​Dmitry: But I didn’t buy anything. ​Vladimir Megre: I bought a shirt and two T-shirts, but it’s not like my bag is really that heavy… Look, what– the light of the sun. I wanted to show you the fields here. ​Vladimir Megre: Shungite affects the water. Some say it heals, others say it disinfects. ​Vladimir Megre: Are you serious? ​Dmitry: I’m trained to present promotional material. ​Vladimir Megre: You’re doing it. I wanted to say, where is it? Let’s try. Is this the one I got yesterday? ​Vladimir Megre: Have you drunk it all? ​Dmitry: I just transferred it, Vladimir Nikolaevich. ​Vladimir Megre: Well somehow you feel good about yourself, you drive with such fun. Here is another view, see? Beautiful view. I’m not sitting in the front seat, diagonal view. Here’s a local village. ​Dmitry: Sober people where? Clean cars. ​Vladimir Megre: Yes, I take pictures so that I feel as if you are going too. ​Dmitry: Football fields, just like in Buzinovskaya. Vladimir Megre: Together with us in Germany. I want to remind you of the idea. I don’t like this format, when you come to another country and people from different cities, they come, you talk for two hours somewhere, and they can communicate with each other, and then they have to leave, vacate the premises. That’s why we’ve decided to find a suitable campground, where people can come. There’s a budget option, you can sleep in your car, you can go back, you can rent a motorhome, ​you can order a simple number there. That’s for who wants a budget option. Whoever wants more comfort can book a hotel room or something else. But like this, in nature. Here we’re in October, October 15th. It’s already cold in many regions of Russia. But look here it’s a warm 22 degrees. So when everything is done in the garden, you can afford to take a little trip. ​Here we’re arriving at the guest house, which is located 15 kilometers from the caravan park, the big space, where modern mobile homes and caravans will set up. Here we are in such a picturesque place, and there’s a guest house. I’ll show you. ​Here… Looking into the sun, though…Now we’re unloading, and I’ll show you the room. The room costs 5,000 per day. The room can accommodate two or three people. So the option is very budget. I should add, that’s 5,000 rubles. Not dollars or euros. ​Vladimir Megre: Here’s the veranda. The room looks like this. ​Here’s the view from the balcony. ​It is very quiet here. In the distance, a tractor is working. ​they are very, very neat. ​Our little delegation is still sleeping. ​But I came out to the balcony and couldn’t resist showing you this beauty. ​From the mountains the sun rose and illuminates a small village. ​The roads are empty. 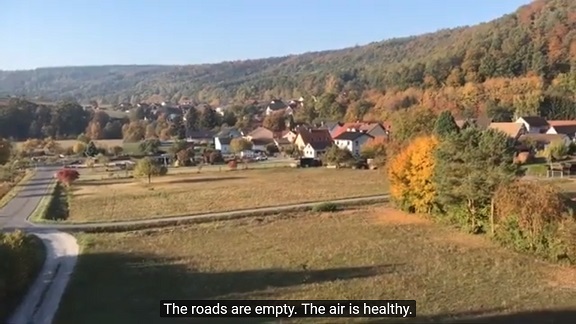 The air is healthy. What are we all doing in the cities? ​it is necessary to make a caravan that will travel to these beautiful places. ​And we sat yesterday, talking. ​Downstairs there is a small restaurant, or how to call it … just where people sit at tables. ​And we sat for a long time, almost 12, and talked. ​German friends came to us and it was great. ​I thought, what if there were more people? ​If there were more of our delegation, then there would be more meetings. ​I will go now, come down and show you some more views. ​ This is a cozy veranda of our guesthouse. ​Our car slept here with the “Ringing Cedars of Russia” emblem. ​This is probably the local name of our guesthouse. ​They are all very neat here, even the stacks of wood are neat and do not violate the landscape. And here is a garden growing on a slope. Apples fall and for some reason, not all are collected. They are rolling, see, lying in the drain. ​We should take one to try, wash and taste. ​and there is an asphalt road across the field. One day in Russia it will be much better. ​Our small delegation is still sleeping, I’ll try talk to the local cat. ​He brought a mouse yesterday as a gift. Where are you going? Come here. Yes, come here and say hello. ​Say hello to my Russian friends and readers. ​Wow. What are you doing? ​ This is how it is. ​You respect them so much, yes? ​ Good boy. Well done, well done. ​How big and black you are. ​ It goes around like this. ​He said his speech and left. ​Now it’ll get fawned, into the feet. ​Will you join us in the caravan? All this beauty, and they’re still sleeping. The only one who woke up is my little grandaughter Ninochka. ​Come on, sit down, we’ll have breakfast. ​Nina Megre: I think we take it from there? Not sure. ​Vladimir Megre: I do not know. ​Nina Megre: He doesn’t speak English, we probably take it ourselves. Here we are at one campground to do some reconnaissance. ​I want to show you how people are relaxing here. ​This campsite is located on the banks of the Main. ​Now we see how there are campers and motorhomes. and it looks like there’s a laundry room. ​and there in the distance, you can see where the electricity and water are connected. Thus you have all the utilities. ​ we can’t video them, but I’ll show the area. ​They live here for two or three months, permanently. ​stay here in a house under the roof and live there. ​Here is a trailer with a tent. ​Very original tent, in fact, it’s increased the area by two. ​Here there is free parking for those who wish. ​ I wonder if it’s drinking water? ​Listen, it must be for drinking. It must be drinking water. ​Dmitry: This is for refilling. ​Nina: The camera doesn’t transmit the colors or flowers. ​Vladimir Megre: Why not transmit? Look how it transmits everything. ​Nina: There are only three of them, here they are. ​Vladimir Megre: This is the situation. Let’s discuss it when it’s more convenient? ​and some with caravans like this. ​Nina: All the greens seem to be overgrown. ​Vladimir Megre: Listen, something man made. ​Dmitry: One pipe flows: one is hot, and this is cold. ​Vladimir Megre: Look at this tent. It’s pretty much a house. ​ you can put them on the plots, that’s all. and live in complete peace. ​This person has lived so long ago that they built a green fence around their house.